Have you ever wondered what humans looked like millions of years ago? Take a trip back in time and make the journey to Sangiran, home of the Java man to find out. The story of Java Man begins over a century ago. In 1890, a Dutch military physician and paleontologist Eugene Dubois discovered a fossilized primate jawbone at Trinil further east down the Solo river. This jawbone possessed distinctly human characteristics. Dubois was convinced that this was Darwin’s “missing link” in the evolution of man but lacked the evidence to prove his theory. Nearly 50 years later, Berlin born paleontologist G H R von Koenigswald, unearthed a fossilized ‘java man’ or homo erectus jawbone in Sangiran. This was a much older fossil, dating back over a million years or more. Dubois was right. Java man was the proof he had needed that homo erectus existed in Java about as early as in Africa. Today, scientists recognize that homo erectus, which inhabited the earth between 1.7 million to 250,000 years ago, are the direct ancestors of homo sapiens (modern human beings). It’s believed that Java man probably made his home in caves or in open camps and it’s likely that he was the first humanoid that used fire. He also used stone axes and hand-adzes, most of which were discovered by the Baksoka River near Pacitan. The Sangiran area is rich in fossils of all types. Along with Indonesia’s temples of Borobudur and Prambanan, Sangiran’s significance means it has been recognized by UNESCO as a World Heritage Site. Follow the history of Java man and the story of his discovery at the small Sangiran Museum. This simple museum is located some 15 km north of the town of Solo (Surakarta). At the museum, learn about how prehistoric men might have lived millennia ago. The fossil shells and animal bones which are on display here range between 1.2 million and 500,000 years old. Also on display is an enormous 4-meter tusks from a stegodon which is estimated to have measured a staggering 11 meters from head to tail! 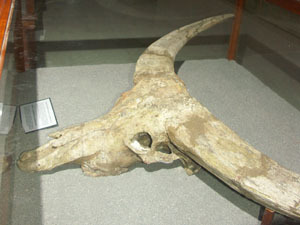 At the Sangiran museum you can see replicas of the original Java man fossils. Learn just how homo erectus was different from modern man. Around 5 km west of the museum stands a three-storey viewing tower where you can see around the Sangiran valley. While you are here, learn more about Darwin’s theory of evolution through an audio visual presentation. The highlight of your journey will be a visit to the 48 square km archaeological site. Located by the Bengawan Solo river at the foot of Mt. Lawu, this site is rich in prehistoric fossils, which often lie exposed in the fields after heavy storms. For anyone with an interest in archeology, this is a rare opportunity to see such ancient fossils.